The Norman Nasal Helmet style of helmet was used when the Normans conquered England. 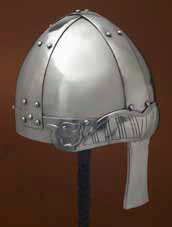 It is historically correct as the Norman troops shown on the Bayeux Tapestry wear this type of helmet. It was made from four parts connected/ riveted with iron bands. It has a nose guard (nasal) with an additional protection of the eyes. The Nasal Helmet was of Western European origins and was used from the Early Middle Ages until the High Middle Ages. This page was last modified on 5 October 2013, at 19:36.